The Mail on Sunday has delivered a decisive blow against the creeping new culture of ‘secret justice’ after forcing the disclosure of a classified High Court judgment about torture in Afghanistan. After a ten-month legal battle, we can at last reveal horrifying allegations over the treatment of prisoners captured by British forces in Afghanistan – evidence the Ministry of Defence wanted to keep secret. We can reveal the secret ruling concerns a supposed Taliban leader, described only as Detainee 806. 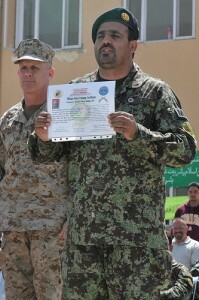 When he was held by UK troops in January 2010, there was already a moratorium banning the transfer of prisoners to the NDS in Kabul, because its interrogation centre there – codenamed Department 17 – had gained a sinister reputation for torture and British forces found it impossible to gain access. Yesterday, the Washington Post finally caught up to where Marcy was over two weeks ago and discussed the UN report “Treatment of Conflict-Related Detainees in Afghan Custody” (pdf). I’d like to move beyond the primary findings of the report, that torture is widespread in Afghan detention facilities and that the US continued bringing prisoners to these facilities long after other nations discontinued the practice due to concerns over reports of torture, and to examine US denials of knowledge regarding the torture. Department 124 was long sealed off from the outside world; the ICRC, the United Nations and other organizations concerned with human rights were barred by Afghan officials from monitoring conditions there. But American officials frequently went inside, according to Afghan officials and others familiar with the site. U.S. Special Operations troops brought detainees there, and CIA officials met with Department 124’s leadership on a weekly basis, reviewed their interrogation reports and used the intelligence gleaned from interrogations to inform their operations, the officials said.